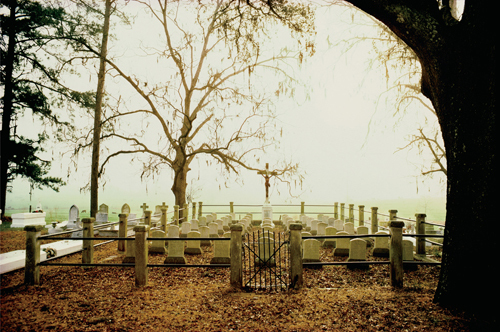 Grand Coteau is an iconic photographic record of a unique, historic Louisiana town, spanning thirty-five years (1977-2012). 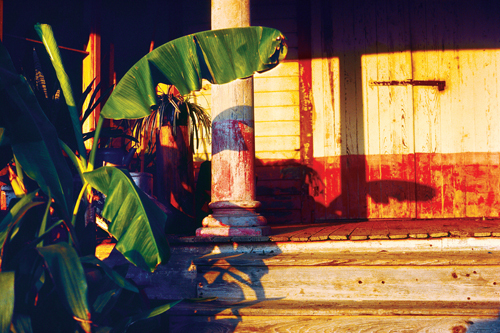 Photographer John Slaughter has selected choice images from his archive of vistas, architecture, and citizens to deliver a poetic presentation. An insightful introduction by Patrice Melnick as well as poignant captions add a social narrative that will inform and deepen one's experience of the artful images. 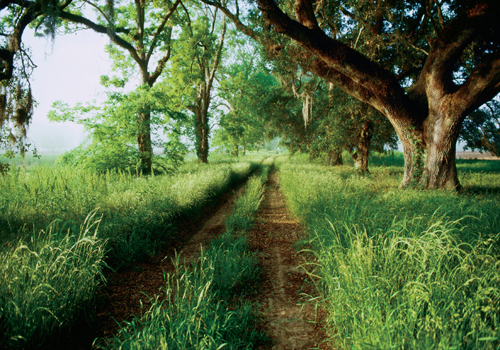 For those familiar with the town, Grand Coteau will expand your appreciation. For everyone else it will reveal a place like no other. 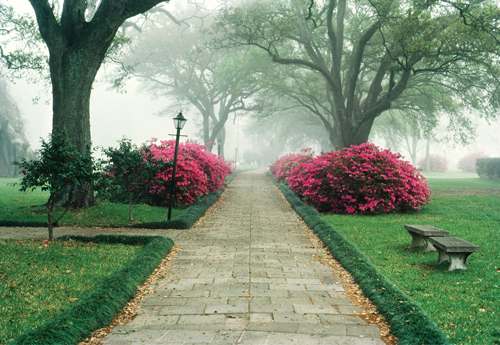 The tranquil, azalea-lined Rodriguez Walk leads from St. Charles College to Our Lady of the Oaks Retreat House. Though faded now, the bricks were originally green, red and natural. At one time, Jesuit novices were required to silently read form the spiritual writings of Alphonsus Rodriguez, SJ (1523-1617) every afternoon as they paced along the walkway. Polish refugee Thomas Malczewski, a bridge engineer, laid the concrete blocks of the walkway. During World War II, he had served in the Polish army but was captured and held in a concentraion camp for his Catholicism. He emigrated to the United States and came to work for St. Charles College, assisting with constuction and book binding. 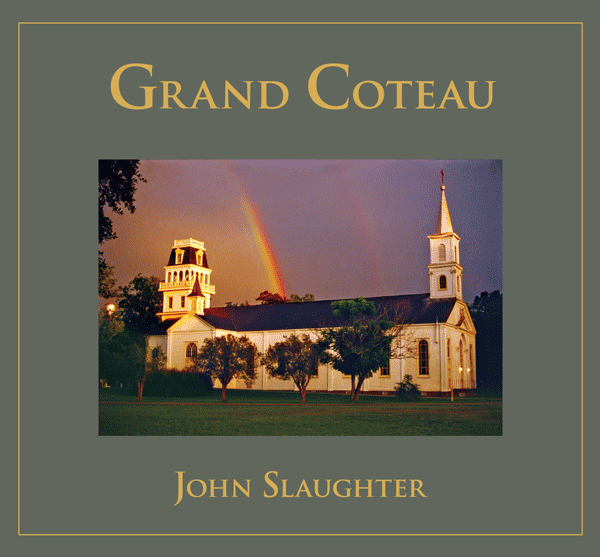 He lived in Grand Coteau for the rest of his life. 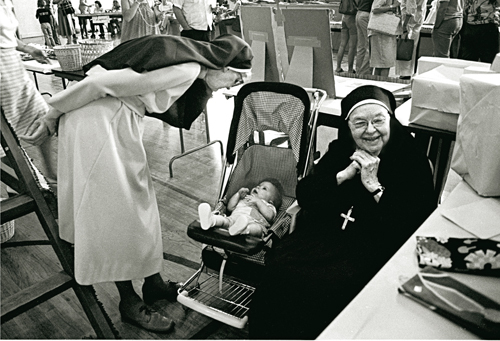 Mother Marie Odeide Mouton (1896–1993) and Sister Corinne Happy (1901–1984) enjoy the Congé at the Academy of the Sacred Heart. Coming from the French word meaning "holiday," the congé tradition began in the mid-1800s. Held in the springtime, it gives students a break from classes. Traditionally, parents came to visit their daughters and children played games like cache-cache, a form of hide-and-seek. Congé takes place at Sacred Heart schools all over the country. The schools consider the congé an opportunity for fundraising through the sale of art, crafts, books, and food, plus a silent auction. Jesuit priests once drove horse-drawn carriages over this path from St. Charles College to the Academy of the Sacred Heart to conduct mass. The fields of St. Charles College are currently populated by cattle, but over the years they have supported crops like corn and sweet potatoes. At times, as seen here, winter wheat was planted, resulting in a glorious green tableau. The Old Jesuit Cemetery includes headstones that date back to the mid-1800s. In addition to the graves of Grand Coteau priests, when the St. Stanislaus Koska novitiate located in Macon, Georgia closed in 1927, the remains of Jesuits in its cemetery were reinterred in Grand Coteau. Photographer's Note: I recall using a tripod and taking a few shots when for a brief moment the scene became luminescent. I got prepared for the next time it would happen and made this one-second exposure. Thus I learned that when photographing fogscapes in color, the ideal moment often comes when the sun is just breaking through. 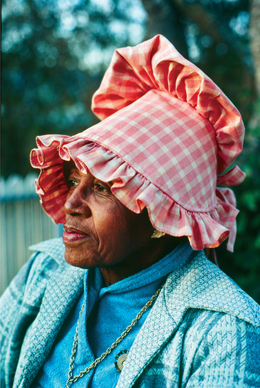 Mary Louise Charles (1908–2010) wears a sunbonnet as she ponders her past. During the Great Mississippi River Flood of 1927, when she was a young girl, her family fled the rising waters of their home in Prairie Basse, located five miles east of Grand Coteau. Alongside scores of others, Mary Louise’s parents and seven siblings traveled by mule-drawn wagon to the higher ground of Grand Coteau. Weeks later, after the waters receded and the family prepared to return, Mary Louise was invited by Madame Theresa Chatrian to stay as a live-in domestic for the family—an offer she gladly accepted. Charles never married and spent most of her life working and caring for the Chatrians. Over the years, she became a close companion of Madame Chatrian, especially after Madame was widowed in 1942. When Chatrian passed away in 1978, in accordance with the will, Mary Louise Charles inherited the Chatrian home (circa 1845) and eleven acres of land. Mary Louise Charles lived to be 101 years old. Located in Prarie Basse, "Uncle Charlie's Store" was owned by Charlie and Frank Lawrence Olivier. It carried dry goods, canned goods, fabric, hats, and other items. Charlie Olivier also conducted business from "hacks," mule-drawn wagons that brought his wares to isolated communities. The hacks traveled weekly within a ten-mile range, reaching towns such as Arnaudville and Leonville. The hack carried a myriad of goods: basics such as flour and sugar, soda, shoes, long underwear, fresh shrimp, and fabric. Eventually, the mule-drawn wagons gave way to pickup trucks. Uncle Charlie's Store closed in the late 1960s. Photographer's Note: This building is just east of Beau Chene High School on La. Highway 93. 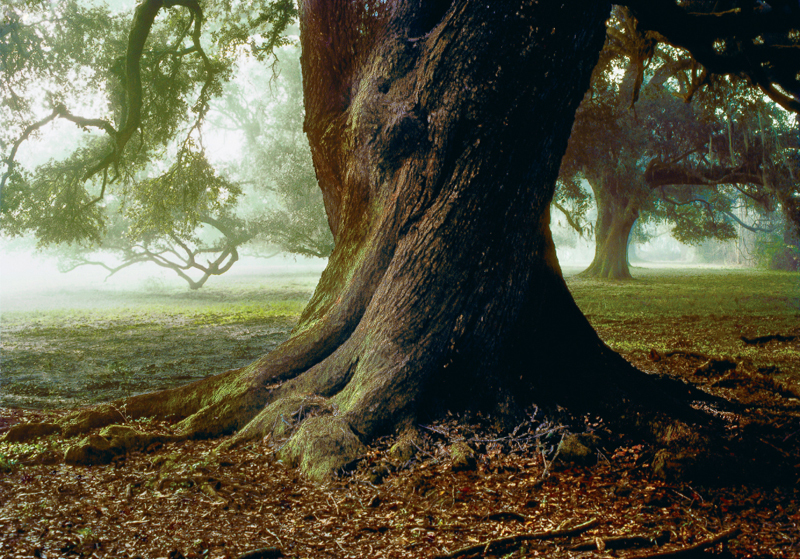 Though technically not in Grand Coteau, it's proximity, history, and overall feel justify its inclusion. 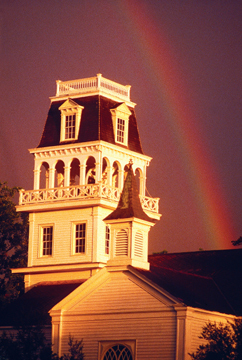 At the time that this photograph was taken, Charles Kimball, a friend and inspiration for many aritsts, was living in the structure. Kimball was particularly fond of bananas and bamboo. John has been exhibiting fine art photography since 1975. 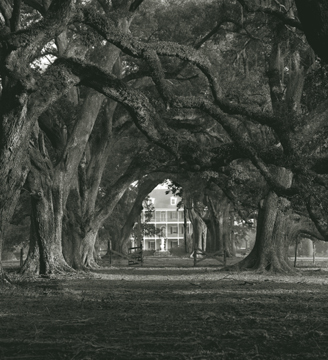 As a resident of Grand Coteau since 1976, he has captured special moments of the town's vistas, architecture, and residents. 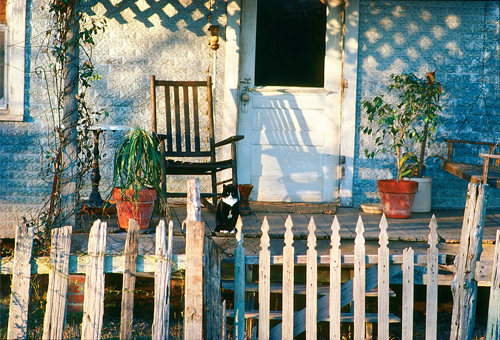 He has lately been photographing in far west Texas where he resides part time in the city of Marfa. 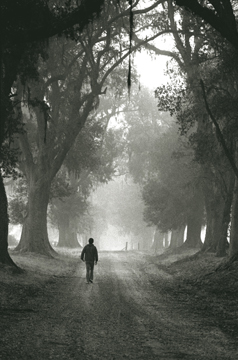 © 2016 by University of Louisiana at Lafayette Press. All Rights Reserved.